Since 1987 Precision Vinyl Corporation has maintained a strong work ethic and belief in our product. We manufacture custom made 20 & 28 mil. vinyl pool liners, and a wide range of other vinyl products. 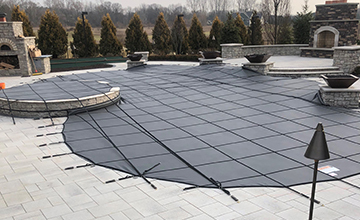 Match any landscape or backyard oasis with a PVC custom liner. Choose from a vast array of colors and patterns from traditional to contemparary. We offer the safety and durability of INTERLOCK seams. Your cover is hand sewn and triple stitched with industrial-strength UV resistant thread. Precision Vinyl manufactures form-fit covers from 12 oz. polyester reinforced vinyl and water bags for securing your pool cover. We repair all brands of winter pool covers adding valuable years to the life of each pool cover. Take advantage of our discounted rates.